According to the latest data from research firm IDC, Huawei shipped more smartphones than Apple did during the second quarter. That allowed the Chinese firm to leapfrog over Apple to become the second largest smartphone manufacturer world-wide from April through June. With 71.5 million units delivered during the second quarter, Samsung remained on top despite a year-over-year decline of 10.4% in shipments. Samsung had 20.9% of the market during the quarter. Still, its worth noting that the Samsung Galaxy S9 is performing worse than its predecessor. Despite not shipping its best phone (Huawei P20 Pro) to the U.S. because of national security fears, Huawei shipped 54.2 million smartphones globally in the three month period. The 40.9% year-over-year gain took the company's global market share from 11% to 15.8%. Apple reported shipping 41.3 million iPhone units from April through June, a small .7% increase. The iPhone had 12.1% of the market world-wide during the second quarter. You might think that of the top five manufacturers, Huawei had the best year-over-year improvement in smartphone shipments in the period, but you'd be wrong. Xiaomi delivered 31.9 million phones during the three months, a 48.8% gain from last year's tally of 21.4 million units. Xiaomi's market share was 9.3% in the quarter. Rounding out the top five was Oppo. The latter saw its smartphone deliveries rise 5.1% from 28 million handsets in 2017's Q2, to 29.4 million during the same time frame this year. 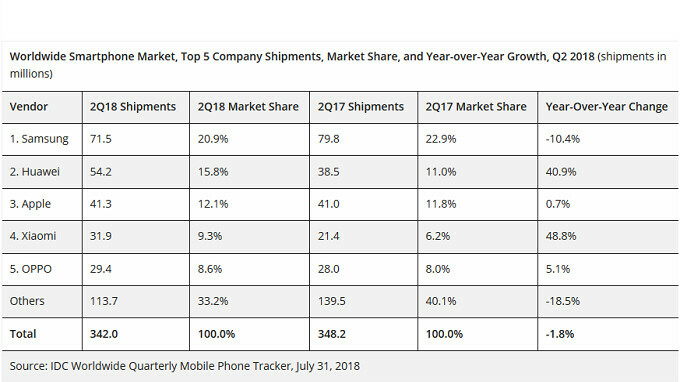 Overall, 342 million smartphones were shipped world-wide during the second quarter, down 1.8% from the 348.2 million delivered during last year's second quarter. Smartphone shipments have now declined for three consecutive quarters. Huawei has previously stated that its goal is to surpass Apple and Samsung to become the number one smartphone manufacturer in the world by 2021. After last quarter, this is looking more and more like a strong possibility. That’s very smart. Now post the ASP LEVELS for all these companies and see which devices people are willing to spend money on and which ones they get for free or almost free. Marketshare is literally like 25% of what matters. I can bet Samsung and Huawei most devices sold are in the $150 level that probably includes cheap $35 flip phones. (Report says smartphone manufacturers but does not say anything about which phones make up their marketshare). That’s why Samsung - we already know is in $250 ASP: meaning that even though they sell nearly $1000 devices the cheap devices take their Average Sales Price down to $250. Consumers that are willing to spend money spend theirs on top end - and due to apples ASP levels at about $700 - proves that consumers rather buy an iPhone flagship rather than Samsung or Huawei flagship in majority. Think past the surface of what’s in front of you. Ah, "ASP" the best feature about the iPhone by far. Seperating people from their money is the only thing the iPhone does best, otherwise it's an average device. No, ASP is what proves what people choose to do with their money when it comes to flagships. I could care less what Apple makes. This is a metric that shows what customers thing in general a better flagship is - not just you and me. By your logic Mercedes are the best cars made but we know that's debatable. The extortionate prices that people are willing to pay for what are just above average flagships only shows the marketing skill of Apple. "The extortionate prices that people are willing to pay for what are just above average flagships only shows the marketing skill of Apple." It's not marketing skills, it's the great device which sells, you don't need more. Where i live iPhone X marketing is near zero and yet it sells extremely well while i see galaxy S9 ads way way too much and sales are very bad. See my comment #47 below. My point is that Apple (and Samsung) have cultivated an image through their marketing. I'm not saying they're bad products, I'm saying there are equally good alternatives available. By my logic? Dude this is how you measure economic data. You apply it against other data to see WHY things are the way they are. You can’t just say, “euro is more expensive than US Dollar”, just by looking at numbers. You need to apply it against what public’s earns on average in those areas to see if it’s more expensive to live in Europe or US. You know - reasons for such data is to weigh what the devices are really about - who’s building what public wants - and my point was - that iPhone builds the flagship that majority wants regardless what fanboys are saying. People buy cheap Samsung devices in majority. But expensive devices from Apple. Thus take away our fanboy mantality - the public wants what Apple offers when it comes to flagship devices. Am I not explaining this right? Oh you're explaining it perfectly. What you don't seem to get is popularity doesn't necessarily mean it's the best. Consumers and the public in general are notoriously prone to the herd mentality. Just ask the British about Brexit now. I arrived in Germany a few days ago and some friends started a iPhone vs Samsung debate. I joined in and, to their dismay, said I wouldn't buy either brand. So I showed them my Mix2 and they were gobsmacked especially when I told them how much it was. (The iPhone X sells for €1200 in some shops here.) I then showed them YouTube videos of the Vivo Nex S and Oppo Find X and they couldn't believe anything like that existed. My point is that they simply didn't know other excellent choices are available for far less money than Samsung and Apple charge. They didn't even notice that Vivo were the Smartphone sponsors of the World Cup despite it being plastered on every tv screen during the matches. This is Germany, the 3rd or 4th largest economy in the world. Being brainwashed by Apple and Samsung clearly runs deeper than we thought but it doesn't necessarily make them the best. Ok all you said is fair, and true. I think we're arguing two different points. You think I'm saying that the iphone is popular - so it means the best, what I'm saying is that Apple seems to know what consumers want in a flagship more than otherguys, because even samsung (the king of Android) is selling majority of cheap $150 phones. I'm not saying iPhone is best, in a matter of fact - I'll say that Samsung is best because it offers so much more, whether its choice or features per device. But I put my fanboy aside and see the big picture. You have to trust the ASP more than marketshare, because marketshare doesnt tell the story. I just dont buy "advertizment" argument because Samsung is advertizing thru their teeth, and offers really nice incentives with every device. For every apple ad I see, I probably see 5-10 ads for samsung (print or media). yet apple pushing more flagship than samsung and ASP proves that. That was my point. but I do appreciate your thoughtful replies. I appreciate your tone and your replies also. By marketing I'm referring to brand image. Apple have successfully positioned themselves as THE top quality brand by carefully marketing their products and pricing them accordingly. Going back to the Mercedes analogy, I've owned two E-Classes and a GL jeep. Mercedes have an image of quality and price their cars accordingly. Well I can tell you that all three of the ones I've owned were complete crap and I'll never buy another one. They look good, drive well and have plenty of bells and whistles but they all had multiple recurring niggling problems that almost drove me insane. The iPhone is a good phone that's simply overpriced for what it offers. Plenty have drank the kool-aid and don't know any better. LoL, I did own a E420 Sport with AMG goodies. Drive is awesome, power is fantastic. But they over engineered everything and that was where it created problems for it. And your points about iPhones are not that wrong. But I had Samsung’s in recent past for a long time - and they have issues that don’t get resolved like they often do on iOS devices within weeks. So even thoug iOS devices are not as quality as they were before stove died - they do great job at keeping the gears turning. That for me is imoportant and Samsung cannot deliver this and especially a Chinese brand. "By marketing I'm referring to brand image. Apple have successfully positioned themselves as THE top quality brand by carefully marketing their products and pricing them accordingly." You can't build brand image from nothing, Apple have build their brand image over these years with amazing products with world best ecosystem. They huge loyal userbase which likes to use their products and ecosystem. Again nothing to do with marketing, Apple is where they are thanks to great products, people are using their devices and spreading stories how well they work and next one buys and fall in love with the product and again the next one is telling to next one how great the experience is. This is how Apple have build their brand name, not by marketing. Apple doesn't even use that much for marketing, they don't need to, their products speaks for themself When i bought my first iPad Retina, i was first from my friends who had one, few months later 4 of my friends bought iPad too because they tried mine, everyone of these people haven't had any Apple device before. "What you don't seem to get is popularity doesn't necessarily mean it's the best." Well how you really define best? It's clearly best for majority of high end phone buyers because it's selling so much more than anyone else. When people just want phone they buy those cheap Android phones, when user really want to get the best phone, well most of them are chosing iPhone by big margin. It's what they're exposed to. See my comments above regarding availability and awareness in Germany. They’re leaders of selling mid range and low end phones not leader in flagship phones like Apple. It's gonna take a decade or two, but yeah, they are. They already have the most powerful economy .USA only produces what you can grow soybeans etc. China been had the most powerful economy. Just out of curiosity, what operating system did you use to type this? When you charge 1000$ + for a phone , you suppose to lose position. Not a surprise at all . Apple didn't lose anything here; Huawei simply sells more phones at lower cost. And when I say lower, I mean substantially lower. Apple's ASP is 3.5x that of Huawei's after today's announcement. That's crazy considering they have relatively similar sales numbers. but is it Huawei's fault that they don't overprice their phones? He didn’t say it’s anyone’s fault, Huawei is no. 2 when it comes to market share. That’s it. Think. Apple's profits come from iPhone sales and their only profit growth comes from raising prices and services tied to the iPhone. If Apple is going to sell less and less iPhones then less and less people will use those very profitable services. You can have an ASP of a million dollars but it means nothing if people stop buying your stuff. Apple is basicly printing money with everything what they do, they make money all the time without doing anything. "You can have an ASP of a million dollars but it means nothing if people stop buying your stuff." Have you seen any signs about people stopping buying iPhones? For me it looks like Apple doing better and better even when competition getting bigger and bigger. Your comment is same level than "what If world ends tomorrow." The funny thing here is that Apple has nothing to worry about lmao. These numbers HURT SAMSUNG more than they ever will to Apple. Apple doesn't sell mid-range/cheap budget devices, Samsung does.